Unlike in other countries, America’s monarchs do not reside in palaces, but rather on Wall Street. Their crowns are constructed not of gold, but of money. Banking dynasties such as the Morgans, Mellons and Rockefellers have enjoyed an almost deified reverence since the inception of Wall Street in the 1890s. When J P Morgan, founder of the eponymous investment bank, died in 1913, the New York stock market closed for two hours and the flags lining Wall Street were flown at half-mast while his body passed through the city. Cohan told World Finance: “It’s harder to get a job at Goldman than it is to get into Harvard.” Author Anthony T Hincks, meanwhile, once commented: “[Goldman Sachs knows] who the president will be before he does.” But the world of banking is changing, and while political connections and investment prowess are certainly valuable, their influence is muted without a loyal customer base. Goldman Sachs started life as a sole proprietorship that bought and sold IOUs from New York businessmen. It was set up by Marcus Goldman, a German Jewish immigrant who came to the US in 1848 to find out whether the streets really were paved with gold. Little did he know. Goldman initially set up shop as a clothing merchant in Philadelphia, which at the time was considered an ‘appropriate’ profession for a man of his standing. He did well for himself, producing five children and amassing a $2,000 personal estate by 1860. But Goldman dreamed of bigger and better things, so, in 1869 – the same year he moved to New York City – he turned his hand to the business of money. He rented a tiny office in the cellar of 30 Pine Street and hammered a plaque to the door that read ‘Marcus Goldman, banker and broker’. Although his life was rather unglamorous and his desk was next to a coal chute, Goldman always wore a tall silk hat and a Prince Albert frock coat. It wasn’t too long before his grand ambitions turned to reality. By 1882, the business was trading around $30m of commercial paper annually, and held $100,000 in capital. Goldman decided that it was time for a partner, and brought in his son-in-law Samuel Sachs that same year, with Goldman’s son Henry joining in 1885. Just like that, Goldman Sachs & Co was born. The firm enjoyed considerable success over the following few years, joining the New York Stock Exchange in 1896 and stockpiling $1.6m of capital by 1898. Tragedy struck when Goldman succumbed to a fatal illness in the summer of 1904, leaving the company in the hands of Sachs and Henry Goldman. The two men had starkly different attitudes on almost everything, which would later prove to be Goldman Sachs’ downfall. In the meantime, the company began to consolidate its rapidly growing financial influence. It entered the IPO market in 1906, taking the hugely successful retail firm Sears public. Henry also began to establish personal stature on Wall Street, and in 1914 was sought out by the government to help design the Federal Reserve System. “Here, at the inception of the government’s regulation of Wall Street, Goldman Sachs was already advising politicians how to do the job,” Cohan wrote in Money and Power. At the time, Henry expressed a desire for the New York Fed to be the most powerful reserve bank in the country, which it is to this day, with Goldman Sachs remaining one of its most important affiliations. In fact, from 2009 until June 2018, the governor of the New York Fed, William Dudley, was an ex-Goldman Sachs partner. The reign of Wall Street’s dynamic duo came to an abrupt end in 1917, when Henry was forced to resign over concerns about his pro-German stance. His departure caused a rupture between the two families, and left the company that his father had founded entirely in the hands of the Sachs family. Just over 30 years later, Goldman Sachs found itself embroiled in controversy once more when the Penn Central Transportation Company went bust with over $80m in commercial paper debts, many of which had been issued by the bank. The sub-prime mortgage crisis in 2007 brought Goldman Sachs the closest it has ever come to collapse, when the firm was found to have profiteered from lending to high-risk borrowers and to have exacerbated the subsequent recession. This led to its transformation into a bank holding company, which was part of an overarching effort to regain the trust of its customers. 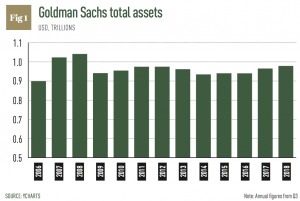 Surprisingly, these missteps, catastrophes and near-collapses have barely left a dent in the banks’ golden armour: current total assets stand at a remarkable $958bn, although that is less than its pre-crisis peak (see Fig 1). And that is what is quite so remarkable about this institution: that it is has escaped unscathed, while its competitors have crumbled around it. The global recession in 2008 played a significant role in that shift in priorities, Cohan believes. “I think [it] also had a bit of a rough patch, to put it mildly, after the financial crisis, and I think [it] learned a difficult lesson about the need to be more engaged with the public and shareholders and to be concerned about [its] public relations. [It’s] very much focused on that now,” he added. The jewel in the heart of Goldman Sachs’ commercial crown is its new savings account, Marcus, which launched in October 2016 in the US and in October 2018 in the UK. Promising a substantial 1.5 percent interest rate, the account is named after the original founder. It’s an interesting decision from the firm to return now to its family-run roots: the bank became publicly traded in 1999, and there are no members of either the Goldman or Sachs families working for the firm today. The last of the Sachses retired from the company in 1959. Perhaps it’s a way for the bank to remind customers of its illustrious legacy. As the financial services sector fills up with challenger banks and fintech firms, promising innovation while sacrificing clout, legacy banks are examining new ways to ensure that they remain relevant in the modern era. 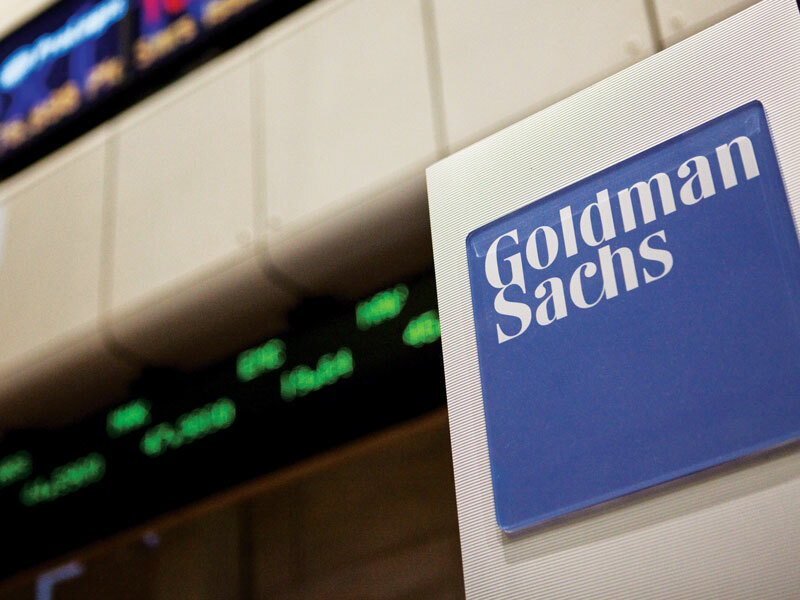 By naming the account after its founder, Goldman Sachs is gently reminding consumers of its rich heritage, as well as the journey that the bank has been on to cement its distinguished market position. After all, monarchies are not built on technology and innovation: they are constructs of prowess, heritage and wealth.